The League has been going for an impressive 34 years now, but despite this they have never played Aberdeen. 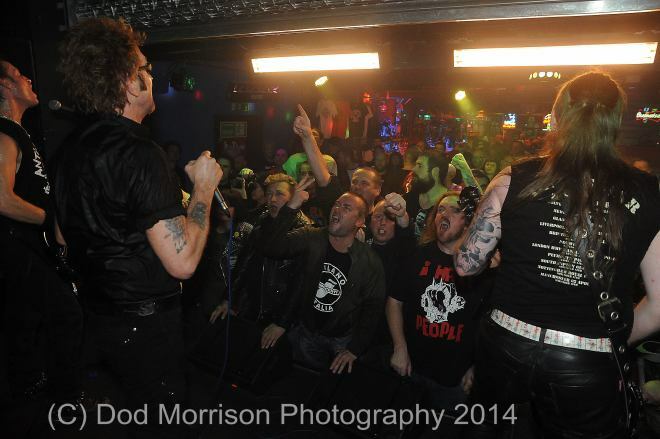 It was a sold out show at the Moorings, the best place for punk music in Aberdeen. The band came on stage and Animal screamed “We are the League!” but nothing happened… Tommy’s guitar was not working! and a couple of hundred people had indeed paid to see them. It was like a sauna in there with people jumping all about from the off. We got 9 songs from the “We Are the League” album, which is in my all-time top ten albums. The band did things differently from other groups, and played the big hitters early, instead of leaving them until the end. “So what”, their most controversial song back in the day and now covered by the likes of Metallica, was their fourth song in, and “Woman” which all the women love too, was a couple of songs later. They both had the crowd going berserk. Animal commanded the stage in his usual leathers, complete with menacing look, scowling at the crowd, dropping to his knees and thumping the ground: the crowd loved it. These guys haven’t lost any of their energy over the years. Shady and Tom came to the front during some of the songs, playing guitar and bass like rock stars, meanwhile Nato on drums was banging away like a man possessed. They were a tight outfit and a great live act. Catch them if you can.